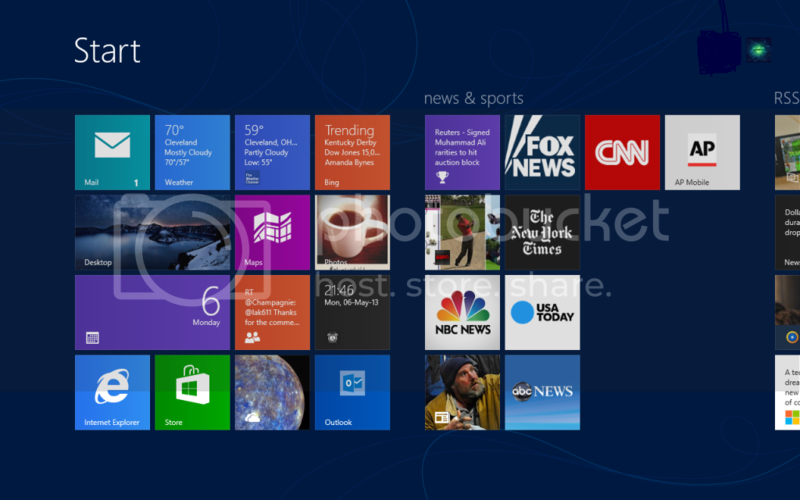 I've noticed that all the great windows 8 commercials show beautiful Pinned tiles for internet explorer websites. Most notable for me is Outlook.com. Can anyone tell me why my Pinned tile for Outlook.com isn't that same as the one on the commercial? Can you change these in any way? Maybe using something like Obly Tile? Anyone else disappointed with Pinned sites? On another note, can you remove frequent sites from the IE10 UI? Its more history than frequent and I want quick access to favorites without sliding. I get a nice looking tile if I pin Outlook.com to the start screen. Not sure if it's the same as the commercial. I'll pay attention next time I see it. To get rid of frequent tiles. On a touch screen, touch and hold the tile. Then select remove when the box pops up. No touch screen, just right click the tile and select remove. Do you have an outlook email address? If so, then add as an email account on your device. From there, it should be in your app list and you should be able to pin it to your start screen just like the other email tiles. That is the tile I get if I pin the outlook.com tile. I tap the pin on the bar next to refresh, tap pin to start and a box pops up with that tile with a box to name it and a pin to start bar to click. This is on metro IE on Surface RT. I'm confused. Mine looks like this. Do I have a setting changed somewhere? Is it different from the mail account that you are logged into windows 8 with? Is this Windows 8.1 ? Same outlook.com email as my Microsoft account. I wonder... Do you have to pin outlook.com before you log in? I am pinning the URL for my signed in Inbox. Is that the problem? Most tiles I pin (like wpcentral) have the "ugly" tile. Some, like imore, just have a color and the ie logo. First let me say, my icon is the same as yours. I just didn't think it was ugly so I thought you were talking about a different one. You can get an icon with that outlook logo you wanted. Unfortunately the account has to be different from the one you were logged in with. I played around and added an outlook.com account that wasn't the same to mail. From there I was able to pin it to the start with the logo you wanted. I'm getting the small not so good looking tile as well. I've tried every combination of singing out and pinning different pages within outlook and haven't had any success. That is weird. So it has to be an account different from your Microsoft account to work? When will MS update Mail to match functionality. Would love sweep functions for my work email. I've found where the icons are located. Thinking about renaming them and see if I can get the outlook.com logo instead of the Hotmail logo. And I'm with you on the sweep. I've used that feature more than I thought I would. Alas no, I just base my start screen off the Xbox 360 dashboard. Mine is the small one too. I also use the same Outlook.com account as my MS account. Well so much for that idea. I thought I had found the folder with icons for outlook and Hotmail. Removed the Hotmail ones, copied the outlook ones and renamed them with the outlook convention. No change, still shows the Hotmail icon. Will keep digging to see if I can find something else to try. I agree with the pinned sites, they do look terrible. I also am not fond of how Metro IE10 manages favorites. I have a huge long list to scroll forever through. Just had a thought, are you sure that isnt the Win8 Mail app Icon when you add your outlook.com account?